The 92HD66B is a low power optimized, high fidelity, 4-channel audio codec compatible with Intel’s High Definition (HD) Audio Interface. 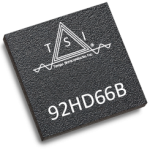 The 92HD66B provides high-quality, HD Audio capability to Internet of Things (IoT), Embedded PCs (EPCs), Single Board Computers (SBCs), notebook and desktop PC applications. The 92HD66C is a low power optimized, high fidelity, 6-channel audio codec compatible with Intel’s High Definition (HD) Audio Interface. The 92HD66C provides high quality, HD Audio capability to Internet of Things (IIoT), Embedded PCs (EPCs), Single Board Computers (SBCs), notebook and desktop PC applications. 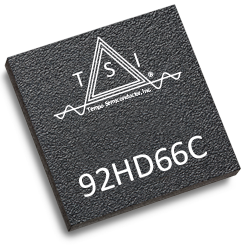 Both devices provide stereo 24- bit, full duplex resolution supporting sample rates up to 192kHz by the DAC and ADC. Both S/PDIF outputs support native sample rates of 192kHz, 96kHz, 88.2kHz, 48kHz, and 44.1kHz. The S/PDIF input natively supports 96kHz, 88.2kHz, 48kHz, and 44.1kHz sample rates. Additional sample rates are supported by the available Windows or ALSA driver software.